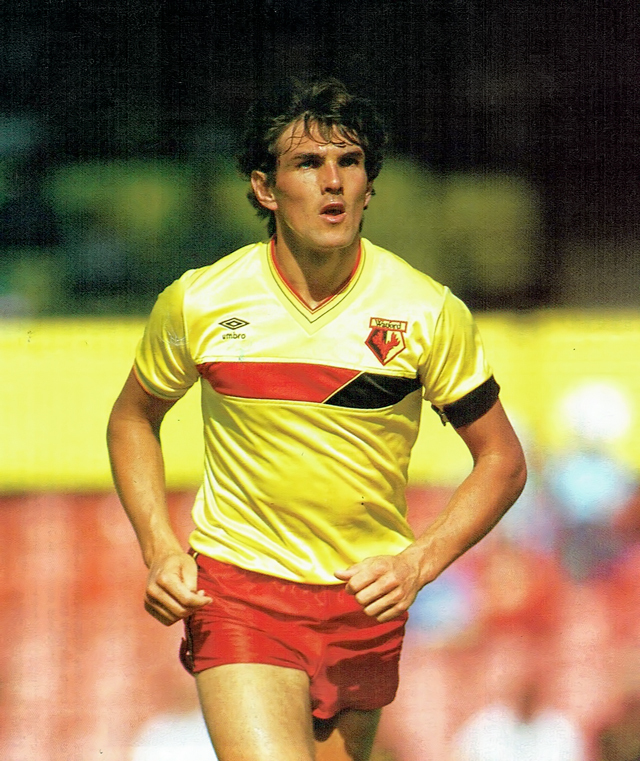 There weren’t many foreign players in the English league when Johaanas Hermanus Petrus Lohman joined Watford in late 1981. Within weeks he’d scored the winner to knock Manchester United out of the FA Cup and then played an important role in winning promotion when Kenny Jackett got injured. He was later hampered by injuries of his own. 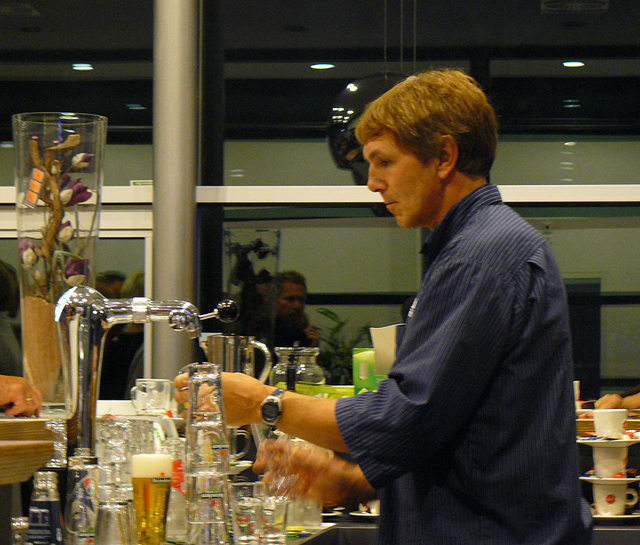 I had hoped to combine a trip to the Netherlands with one of my cycling-related assignments but I couldn’t make it work, so I ended up calling him one afternoon and learned that he ran a bar in Roosendaal and still had very fond memories of his time in Hertfordshire. There weren’t too many foreign players in the English league in the 1980s, although Ipswich Town had signed Dutch players – Arnold Mühren and Frans Thijssen. How did you come to join Watford? Everyone in the Netherlands watched English football, even then. It was on the television and everyone watched the FA Cup final. They all knew Liverpool, Manchester United. I loved the style of play, especially. I started my career with Royal Sporting Lokeren in Belgium. I had a big problem with Lokeren because at that time in the Belgian league you could only use three foreigners in a match and we had seven foreign players. So I wasn’t playing. We had [Grzegorz] Lato, [Wlodzimierz] Lubanski – who were both Poland internationals – and [Preben Elkjaer] Larsen, who was a Denmark international, so it was very difficult for me. There was very little chance of me playing. I went on loan to a couple of clubs in the Netherlands. I went to Vlaardingen [in the Dutch league], then I went to Nijmegen on loan. Lokeren didn’t want to sell me to another club in Belgium and the price they wanted was too much for Holland. I was stuck in this situation. How did Watford get in touch with you? A few people tried to get me into contact with clubs in England. Someone contacted Theo Laseroms about me. He was a former player with Feyenoord and he’d been my manager when I was on loan in Holland [at Vlaardingen]. He was called Theo the Tank. Anyway, he recommended me and then there was a player called Paul Kerlin who was English and had played in the Dutch league. He recommended me to Watford. I just wanted to move from Lokeren because I couldn’t see how I would play. When I went on loan to Nijmegen they wanted to take me but they couldn’t afford the transfer fee and Lokeren wouldn’t drop it, so I spent three months when I didn’t play and I couldn’t move. It was very frustrating. When Watford came in, Lokeren did drop the price but by then it was too late for Nijmegen because by this time they’d bought two other players. I think they [Lokeren] were playing a game to get as much money as possible for me but it didn’t work because in the end no one would pay what they wanted. So, Watford contacted me in September 1981. They asked me to come for a trial and I went over and had a few weeks in England. But there was a problem in Watford. I was supposed to play a few games in the reserves or something but I was not allowed because I was suspended. I’d refused to sign a contract with Lokeren, but they held my registration and because I’d refused to sign, I wasn’t allowed to play. It was crazy. I didn’t sign a contract, I refused it. So automatically I was suspended by the Belgian Federation. So they told Watford that if they played me they would be fielding a player who wasn’t allowed. So it was crazy. All I could do was train, so I trained every day like it was a match. I heard you tackled people hard in training on your first day. [Laughs] Yes, possibly my tackles were a bit too strong for training but I wanted them to notice me. That was my game. I was a strong player and I wanted to show my best. At the end of the week, they said they would give me a chance if we could sort everything out with Lokeren. I was quite cheap for an English club. What else do you remember about that trip? I met Graham and Elton and I got a very warm welcome. It was very nice. They gave you a really nice feeling about what they wanted. I watched English football when I was in Belgium and Holland. I didn’t know much about Watford because they were in the Second Division but Theo and Paul had told me they were a very well organised, well-run club. But I liked the game in England. It was a fast and physical game and it suited me once I got used to it. But first I had to solve all the problems with Lokeren. It took a while. I played in the reserves a few times but the pace of the game took a while to get used to. The team was doing very well in the Second Division when you joined. You scored on your debut against Charlton Athletic. I had a good start. I scored in my first reserve game, and I scored in my first game in the first team. The players made me feel really welcome. I became good friends with Wilf Rostron. We had a very young side so I fitted in. I was only 21 so they were all my age. When I first arrived I lived with Nigel Callaghan’s mum and dad. I lived there about a year and it was good fun. Nigel was there at the same time. I travelled with Nigel to the training ground in his car. What was his driving like? [Laughs] I joked – don’t you drive on the left in England! Within a month of your debut, you scored the winning goal against Manchester United to knock them out of the FA Cup. What was that like? I knew people back in Belgium and Holland saw the highlights on TV. It made me a star. It was amazing to play against Manchester United. I knew all their players but when you see them, they are just the same as you and I felt we could beat them. When I first signed for Watford I didn’t have a very good contract at all. They gave me a contract for two years but it really wasn’t for good money but they said that if I played a number of games in the first team they would increase my contract. I played ten games and they gave me a new contract. They didn’t have to do that so quickly but they did it and it was very nice. They were very correct people. It was a very correct club. You played a key part in the promotion run-in because Kenny Jackett had got injured. That really helped because I was in the team and we were doing well. Then we came to the game against Wrexham and the chance to go up to the First Division. I wasn’t nervous at all. We were all about winning and I think we all knew we were going to do it. We used to talk about it with Graham Taylor. We were such a positive side, we would go out and try to win. We won quite easily and we had to run off the pitch as the fans ran on. It was very busy in the town afterwards with everyone partying in the town. We went into the town to celebrate, we went to Baileys or Paradise Lost [the nightclub], then we went back to the Ladbroke hotel and we had some breakfast at five in the morning. It was amazing. I had been in England five or six months and we were going to the First Division. What do you remember about that season? I was in the team and out sometimes. I had some injuries but also Kenny Jackett was fit so I wasn’t in the team all the time. We had a very good start. We were a young side and we were very fit. We could also score goals out of nothing. We were very organised and that was the work of Graham Taylor. We played with only two midfield players and usually I was with Les [Taylor]. We were quite similar players. There was a lot of running to do because there were only two of us. Sometimes I would play on the left-wing, if John Barnes played in the centre forward position, and I liked that because there was a bit less running. We had some great games that season. I remember the one against Luton at Vicarage Road. We won [5-2] and it was a real battle. I loved playing Luton because I loved those competitive games. That summer I got the fittest I had ever been and I felt so good at the start of the season [1983-84]. He made me captain a few times and I got to play in Europe. I’d been on the bench in Europe for Lokeren before but never played. I thought we played very well against Kaiserslautern away. I think we were a bit unlucky to lose 3-1. I scored a goal, which was disallowed. I hit it from well outside the box but the referee disallowed it for offside against Richard Jobson. I felt so good but then I got a bad injury. I got injured against Stoke. It was just a kick on the knee and I didn’t think too much of it in that game but it got worse and worse. I managed to get fit for the next game, against Spurs, but it got much worse. I was struggling in that game. It’s the one where Glenn Hoddle scored that goal. It was on the TV that night. He did me first, then he clipped it over Sherwood. I wasn’t too pleased with that one. I had a fitness test before the game against Kaiserslautern but I could hardly run. I had torn my cartilage and articular cartilage in my left knee. I had three operations on it in England, then another one in Holland. It was a bad injury. When I had that bad injury Watford offered me a contract for two years, which was very good of them. That’s when you start loving the club. They were correct people all through the club. I was out for a year but Graham offered me a contract for another two years. I was very grateful for that but sadly I was not really able to come back at the same level. Was it hard being injured for so long? It was but I made Watford my home. I moved in with Gary and Gracie Jordan, who were amazing supporters of the club, and I stayed there for another two years. Later on I bought a house from Watford FC in Abbots Langley. Even when I was injured, I was always busy at Watford. You have presentations to do. You went to hospitals or pubs to represent the club. You only got one day off in the week. Everyone was happy together. We were all friends so it made it a lot easier to be together. I worked hard to get fit but it was a long injury. You were out of action from September 1983 until December 1984. That was a long time to be injured. Yes, and by the time I got back the team had changed a lot. I remember when I came back we played Luton three times in five days in the FA Cup. There were two replays and we played on Monday, Wednesday and Saturday. It was very tough, especially as I had been out for so long. They were derby games and they were a very good side so it was hard but I recovered from each match well and I felt I had recovered from the injury. In that moment I thought everything would be okay because the knee was okay but shortly afterwards I got injured again and I was out for another long time. You were out for another six months and came back in the autumn of 1985. This time I talked with Graham Taylor and he made a deal with me. I am the sort of person who wants to play. He promised that if I was not in the team he would give me a free transfer. I wasn’t regular and so I moved on, which was very good of him. It was very disappointing because I think Watford was perfect for me and I was perfect for Watford but the injuries were too much in the end. But I loved the club and the people. I started to listen to Elton’s music. He was like one of the lads – he travelled with us, he held parties and invited the players. It is amazing even now to say that I played for Elton John’s football club. When I tell people they look at me like I’m crazy. Who else do you remember? I remember when Maurice Johnston arrived! Everyone knows how he was. He was a funny lad – always made us laugh, always wanted to go out. He was excellent at the football but he was a bit difficult for the club. Sometimes he didn’t have respect for the manager because he made comments in the newspaper. Some of the other young lads thought they could go to a disco and not train so hard, but they couldn’t get away with it. But Maurice could come out of a disco and play well. He didn’t need a lot of training. He was a great player. I had never seen a goalscorer like him. He had the skill, he could score goals. Not long after you arrived, there was a friendly at Vicarage Road with your old club Sporting Lokeren. Was that part of the transfer deal? Yes, it was. It was nice to play against my old team. Lubanski said we were a great team. He said to me afterwards, ‘If you can play with four forwards and go one against one at the back, you must be some side.’ There were a lot of compliments from the players for the way we played. That was nice to hear because they were experienced players and they had played in Europe. I felt we would do well in Division One but I couldn’t imagine we would finish second behind Liverpool. The last day of the season was a great night. I played the last half-hour and we won 2-1, Man United lost and we came second in the league. Elton was there too and the whole club was celebrating.